The most serious threat to native wildlife species in the Northern Forest is the conversion of natural lands to development. Many wildlife species that live in the Northern Forest require large areas to carry out their life cycle, suggesting a landscape scale approach is needed to ensure long term biological conservation. However, top-down landscape level planning is challenging in the Northern Forest, where the majority of lands are under private ownership, resulting in landscape patterns that are driven from the bottom-up. That is, individual decisions made by local land owners and towns acting in their own interest collectively determine landscape quality for wildlife species, for better or worse. The issue of how to “design” a landscape that meets the needs of multiple interests is inherent in the town planning process. Often, however, wildlife is a silent stakeholder in this process. The goal of this project is to develop a prototype of a Structured Decision Making (SDM) process that will bring wildlife to the table in local town planning efforts. 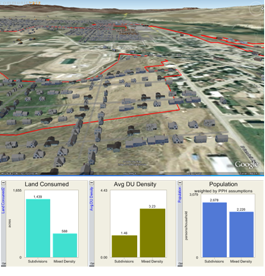 The first phase of the Structured Decision Process is to develop measurable objectives (indicators + standards), such as “Ensure that at least 40% of the town is forested.” To establish indicators and standards for development for 8 Vermont towns, we will develop visual preference surveys that combine CommunityViz software and Google Earth. Residents will be surveyed and asked to respond to visual images of varying levels of development, agriculture and natural lands within their local community. Results of the survey will establish town planning objectives in terms of development, forest, and agriculture for each town. Given individual town objectives, we will use data from previous NSRC efforts to assess the likely ecological consequences of these “norms” for a variety of forest-dependent wildlife species. This process will, for the first time, allow state biologists to evaluate how planning objectives for a collection of local towns acting will likely impact landscape quality for wildlife species. Our goal, ultimately, is to make develop this process so that all communities in Vermont have access to this approach, thus providing state resource managers with an opportunity to determine if state-wide wildlife objectives will likely be met through individual town planning processes. Espenshade, J., J. D. Murdoch, T. M. Donovan, R. E. Manning, and C. A. Bettigole. Public acceptability of development in the Northern Forest of Vermont, USA – the influence of wildlife information, recreation involvement, and demographic characteristics. Landscape and Urban Planning. Donovan, T., R. Long, A. Troy, A. Vionov, and W. Keeton. Land use change in Northern Forests: Assessments and recommendations for conserving biodiversity. 1st Meeting of the Northeastern States Research Cooperative, Burlington, VT, 13 November 2003.